For most of The Leviathan, we suspect that we'll get away from a murder investigation into something more intellectually fun: seeing both a robbery and Sherlock Holmes (Jonny Lee Miller) himself slightly stumped. By the end we do get a couple of murders to cover up the original crime, which to me is a bit of a shame. 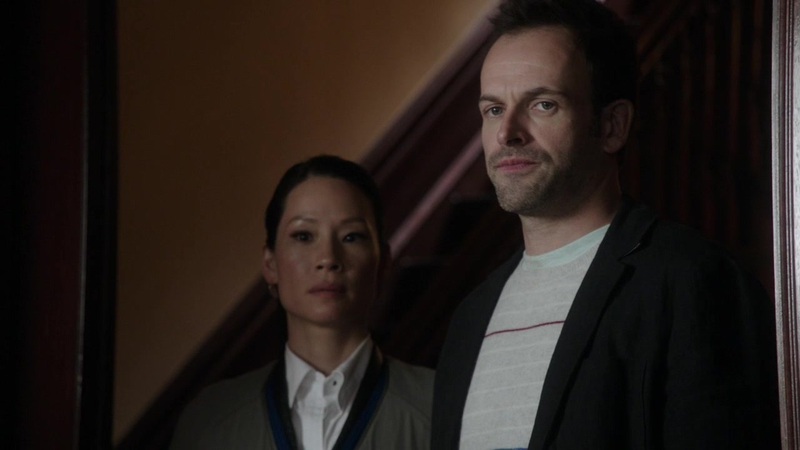 It would be a nice change of pace if Elementary had a crime other than killing to deal with, but The Leviathan, until we see the bodies pile up, get a great case along with a greater emphasis on Joan Watson (Lucy Liu) and the complicated relationship she has with both her family and Holmes himself. Holmes is called upon by the makers of The Leviathan, a safe that is considered unbreakable, to investigate a break-in to the same. The security code changes every two minutes, which makes the break-in more puzzling. Furthermore, if news leaks that a second Leviathan has been broken into, it will ruin the company. Four years earlier, a previous version of The Leviathan had been broken into by four people, one who has died and the other three always refusing to talk. Holmes is confident that he can solve this in an hour or two, but seventeen hours later he is still stumped. This inability to admit defeat is causing difficulty for Watson too. Her mother Mary (Freda Foh Shen), already displeased with her daughter's line of work, wants her to bring her 'baby' to meet Joan's brother Oren's new girlfriend. A little pressure from Oren (Stephen Park) gets her to agree. Holmes puts together that the only way they broke into the Leviathan the second time was that someone gave them the formula to the first time. With that, they track down one of the surviving criminals, who tells them the secret was sold to a shady figure named Le Chevalier. This mysterious thief had already stolen priceless works of art and works for pleasure. While Holmes and Watson do find Le Chevalier (and a rare Van Gogh he stole years ago), the infirm old man who had suffered a stroke couldn't possibly be the Leviathan mastermind. Holmes is still stumped, but his mind gives him an idea. One of the criminals went to a jury trial, and he now suspects one, perhaps more, of the actual jurors basically got the recipe in court. IN the midst of the investigation Watson is surprised to find Holmes has changed his mind and gone to meet the Watsons. He not only is highly complimentary to Joan but shows himself to be a witty and charming dinner guest. While he insists he did it more to give them what they wanted to hear than anything else one suspects he really is just trying to cover up his true appreciation for Watson. Now he notices that four of the jurors had similar skills to those in the original Leviathan break-in. Holmes then deduces that what started out as a joke turned into a major heist. NOW is when the bodies start piling up. First one juror who had the diamonds hidden in plain sight is found dead. The blood in the apartment lead to an unlikely suspect: a Marine who had been deployed to Pakistan at the time and has no connection to any of them. However, Watson notices that she had been a bone marrow donor, and one of the jurors had had leukemia. One of the affects of bone marrow transplants has the donor's blood type mask the actual person's blood type. With this, and after another dead body, we find the criminal. The Leviathan, as I've stated, lost a good opportunity to put a focus away from Killing-Of-The-Week and focus on a different sort of crime. I would have liked for the robbery to have been the sole focus of the story. I also thought Corrine Brinkerhoff and Craig Sweeney's script (the first time I think an Elementary episode has had two writers) took a wrong turn by going into the Le Chevalier subplot. Granted, it would have been too easy to get him to have been the culprit, but it would have been nice to have seen this master-thief as perhaps either a worthy adversary or someone who could in a later episode taunt our dear Mr. Holmes. Of course, there is nothing to say that the son might not have picked up his father's hobby. Nothing certain but the door is open. However, what IS positive about The Leviathan is that yes, for MOST of the story we don't have murder, and that we don't short-change the Watson subplot. In fact, Miller and Liu have some of their best moments when they deal with the family. Despite protests to the contrary, one senses that Holmes does appreciate Watson's intelligence and that he does see her as not the nuisance he constantly protests she is but an important partner in crime-solving. It is good to see Joan having a complicated relationship with her mother but also that her mother has come around to seeing that her time with Holmes has actually done something any mother would want for her child. It has made her happy. It is also nice to see Holmes in a rare moment actually having a hard time solving a case. Oftentimes the portrayal of Sherlock Holmes in Canon and non-Canon based works (Elementary included) makes Holmes to be almost superhuman in his deductive abilities. Here, he comes across something that he can't solve in an afternoon. He actually finds the case more complicated than he first thought, and the fact that he struggles with the case makes Sherlock Holmes a more human, dare I say fallible human. That and his acknowledgement (real or not) of Watson's abilities and importance to his work and life in general make Holmes a more rounded individual. It's a credit to Miller's abilities to make his praise of Joan (and the 'taking-back' of the same) both believable and insincere at the same time. Liu's performance with Watson's family also is a highmark, as is how despite what she knows of Sherlock Holmes, she still is surprised by his antics. On the whole, The Leviathan had great moments with Miller, Liu, and the Watsons. The case was interesting though marred by the killings at the end. However, it still maintains Elementary's strong streak of a strong debut season episodes.